There are numerous articles about the importance of logos and branding; why they’re both necessary and an investment. There are also SO many options available to a business, organization, or individual when choosing a logo. How is a person to choose? Most things come down to time and money. Get a $5 logo in 5 minutes or get a complete branding system and spend $2,500. The hard truth? You get what you pay for. And what you pay for comes down to experience and relationships. In an effort to more clearly communicate what goes into creating a new logo and why it takes a minute, I’m sharing my process for designing and delivering logos. This part is crucial in determining if a client and I will make a killer team. Phone calls help to establish a little bit of trust and verify that I am, in fact, a human who does what I say I can do. Not only can you get a pretty good feel for personality in a quick call, but you can cover a lot of ground and answer a lot of questions in 15-20 minutes. Ready to roll? I like your style! You can schedule a call at any time that works for you. Another form? Ugh! I know, I know, you’re really busy and you don’t have time for another online form. I created my Branding Questionnaire as a quick-and-dirty way to share your business details. You know your business better than anyone else so it’s really helpful to hear the history and details from the source. And honestly, this is a great way to gage where an organization and its leaders are at in the process. In my experience, when I have to write things out, I am forced to wade through my thoughts and communicate them as best I can. I find that folks who are willing to put in the 10 minutes to share their vision for their organization, are serious about investing in a logo and branding suite. I encourage folks to take this before or directly following our kick-off call so we can work through any missing pieces or dive into more detail. This takes about 10 minutes. You don’t have to fill out every field – just fill in what you can and move on! Performing research includes surveying the branding of both competitors and businesses outside your industry. This does not mean slapping together an exactly-the-same-but-different logo for your own business. But there are important insights to be gained. Does everyone in your industry look the same? Is every single logo blue? That could mean you have an opportunity to pick a look that sets you apart! This is the step where I explore the relationship between every word, shape, letter, and color that corresponds to your organization’s name, service(s), and mission. Completing this phase includes a lot of thought and tedious sketching. My research phase means getting everything out of my head and onto paper. I fondly refer to this as “getting all the bad out” which inevitably leads to many pages of pencil sketches and later…the good stuff. This takes about 2 weeks. Why so long? It’s the most tedious step requiring equal parts thinking and designing. 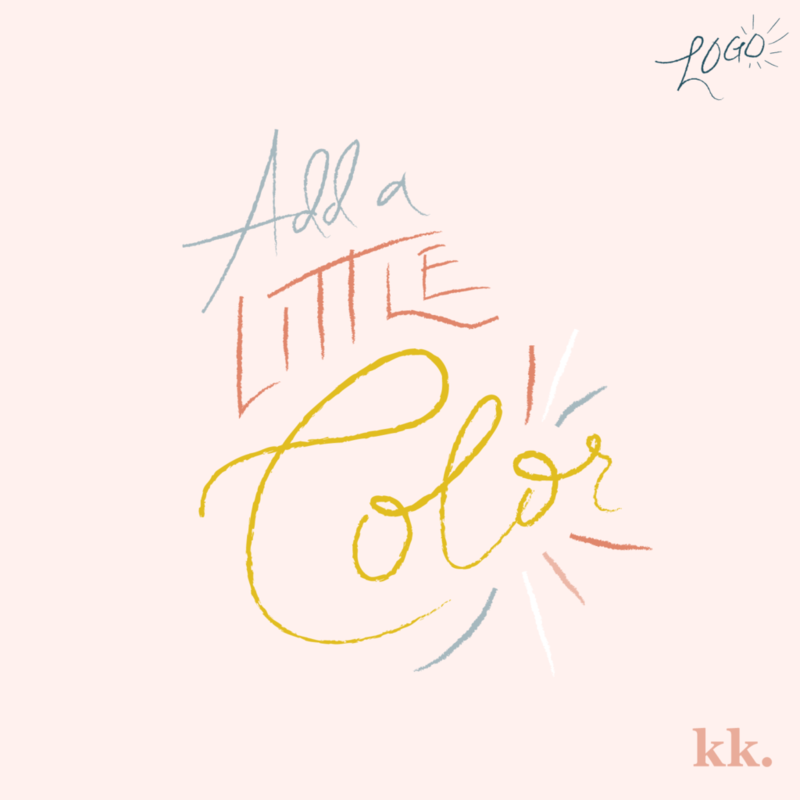 Plus, I’m lucky enough to work alongside lots of clients so I need time to keep everyone’s projects moving forward! After researching and sketching and sketching some more, I move to the computer screen. What does “moving to the screen” even mean? So glad you asked! This means I use my digital design tools and software to trace, recreate, and build upon the sketches from the Research phase. Designing on my computer (aka my life) allows me to quickly design, refine, and iterate. I typically present 3 logo concepts for my clients to consider. I like to have to discussion over the phone or in person to help explain my decisions. (This can’t always happen and that’s fine). The variety of the options (how similar or different they look) really depends on the client and project. If we have a crystal clear vision to begin with the options maybe be more similar than an organization who is still grasping how they want to visually represent themselves. I encourage clients to choose the concept that will most clearly represent and communicate their business to their customers. Once a concept is chosen, I allow one round of revisions and a final stamp of approval. 99% of the time, one concept is the obvious winner in the client’s eyes. And I pretty much always agree. So why offer three options? When I’m personally investing in something. I do a lot of research. I want to know I’ve chosen the best option for me. Picking a logo for an organization is a big investment and I believe clients want to know and see that I/we have considered and explored the best options for their goals. This takes about 1 week, but can take longer depending on how long it takes to present concepts, review options, and receive feedback. This step is born of my personal belief that a logo, at minimum, should “work” in black and white. But there are practical reasons, too. Wouldn’t it be great if a logo is readable on documents printed or scanned in black-in-white? I think so! Trying to keep costs down? Black-and-white helps. This is the step where I carefully consider color theories and create palettes that further reinforce the client’s visual presence. I have had many folks share strong color preferences and I’m happy to accommodate those. (“I hate orange!” or “We are all about water, so please no red!”) You’ll get to see your chosen logo in each color palette. 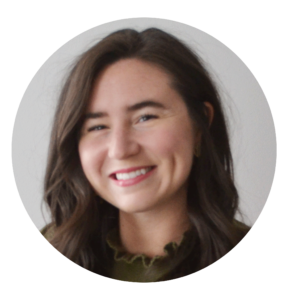 I also include some real-world examples – like a polo shirt, a billboard, or sign – because seeing the logo in different sizes and applications can help clients visualize their new logo and get excited about using it! This takes about 3 days. Put your brand to work! Once your logo and palette have been approved, I will deliver a Brand Guide to you. What do you get? A Brande Guide includes all the details about your logo, your color swatches, and how to use all of them. Plus, you’ll get various filetypes of your logo. Um, what? You’ll probably want JPEGs or PNGs for your website or social media. EPS and PDF files are great for printing. I’ll make sure you have what you need. If you’re going to invest time and money in a logo, it makes sense to know how to use it! Consistency is key. 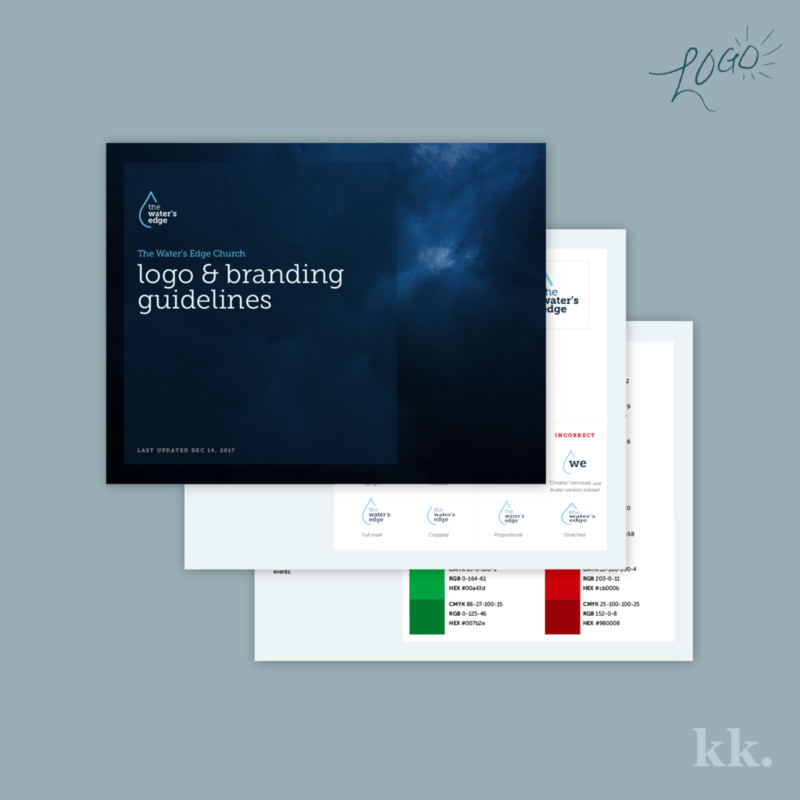 If you’re not personally responsible for implementing your new logo, Brand Guides make it so easy for your marketing folks, printers, or other partners to know how to best serve your new brand. Now you’ve seen the step-by-step process of how I create a logo. Even though I might be the one creating the shapes, you can see the project takes teamwork! My goal is to create an environment where we can have honest conversations with a little bit of humor. Finding a graphic designer you trust is crucial because logo projects are an investment and honest feedback is the only way to move forward. Thanks so much for reading, I hope it was helpful or insightful to learn more about what goes into a logo project! If you’re interested in working together, get in touch! If you might maybe possibly be thinking about a new logo, you can see some of my past work before taking the first step. Think we’d make a great team and ready to move things along? Take the Brand Questionnaire and I’ll be in touch!